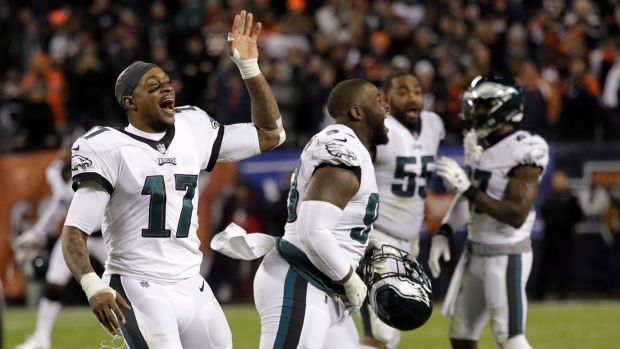 CHICAGO — The Philadelphia Eagles needed help to get into the playoffs, and Chicago provided it. Nick Foles hit Golden Tate with a 2-yard touchdown pass on fourth down with 56 seconds remaining against the NFL's stingiest defence, lifting the Philadelphia Eagles past the Chicago Bears 16-15 on Sunday in the final wild-card game. "I think the big thing is, we saw some adversity tonight in the first half (and) I had a couple of turnovers," Foles said. "I think the big thing is that no one loses faith, no one stops believing, everyone just keeps talking, keeps believing in one another, and we just rallied. Our defence really kept us in this game." These Eagles, led by Foles once again replacing an injured Carson Wentz, and a defence down to backups at several positions, seem to have that magical touch like last season. It was a sizzling ending to a game marked by superior defence and several critical mistakes by the Eagles. They had to survive after Tarik Cohen, an All-Pro punt returner, took back the kickoff following Philly's go-ahead score 35 yards. Mitchell Trubisky completed two passes to get the Bears close enough for Parkey. But his kick took a double deflection and fell harmlessly into the end zone.